‘Lessons have been learned’ after delivery of the Littlehampton to Bognor Regis cycle path took 15 months longer and cost £1.2m more than planned. This was the reaction from officers at West Sussex County Council after councillors asked them to review how the scheme – which caused ‘horrendous’ traffic problems – had been conceived, funded and delivered. The route was officially opened in August, but during the works readers criticised the traffic delays caused by its construction. 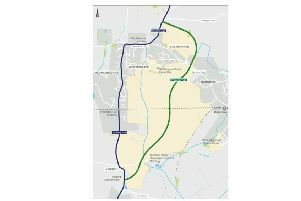 Members of the environment, communities and fire select committee heard on Wednesday (November 14) that the council had been told in 2014 that the cycle path would cost £865,000 to design and build and that it could be done in the space of a year. With the money secured from the Coast to Capital Local Enterprise Partnership (C2C LEP), the scheme was approved – but it ‘became clear’ that more money was needed. When C2C LEP rejected the idea, it fell to the council to fork out £1.2m. The scheme took two years and three months to deliver, including nine months of construction, and cost just over £2m. At a County Hall meeting, officers were asked why no ‘alarm bells’ had sounded early on when it became apparent that the scheme had been costed at a much cheaper rate than similar ones elsewhere. Nobody questioned the need for the cycle path and it was welcomed by several members. Jacky Pendleton (Con, Middleton) said the number of cyclists travelling the route had increased now that they had a safe place to ride. But she was critical of the way traffic had been controlled during the construction, particularly around three sets of traffic lights. She also questioned the ‘lack of communication’ from the council when it came to keeping the public up to date. It was a view shared by Daniel Purchese (Lib Dem, Rustington), who said people had been left ‘frustrated’. With other highways schemes in the pipeline, committee chairman Andrew Barrett-Miles asked if officers were confident that the organisational structure was now strong enough to ensure the problems did not crop up again. Afterwards Labour’s Michael Jones described the situation as a ‘fiasco’ and felt the difficulties with building the cycle path were ‘entirely foreseeable to anyone who knows the area’.